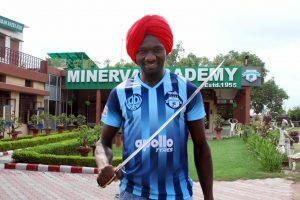 I-League champions Minerva Punjab FC sign Nigerian striker Donatus Edafe! Home / Indian Football / I-League / I-League champions Minerva Punjab FC sign Nigerian striker Donatus Edafe! Minerva Punjab FC have signed Nigerian striker Donatus Edafe to strengthen their attack as the Warriors travel to Mizoram to take on Aizawl FC. Donatus started his career at Nigeria National League II club Jigawa Golden Stars FC’s Youth Team after which he featured for Abuja-based FRSC Strikers FC and Mighty Jets FC’s who play in the Nigeria National League where he played his first team football. He then moved to Slovenia on his first assignment abroad where he featured for ND Gorica playing in the country’s top flight Slovenian PrvaLiga. The 25 year old Donatus Edafe who signed on the dotted line for Minerva Punjab FC days ahead of their Round 3 clash away against Aizawl FC was excited on featuring for the defending Champions and was well aware of the responsibilities he would shoulder in the games to come. Previous Nilox signs a three-year agreement extension with Inter Milan! Next XtraTime VIDEO: Is Mohun Bagan already under pressure in I-League!